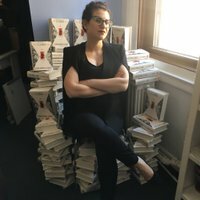 @MiriamAnneW Okay, but is anyone at Tor writing a book focused around a majestic, marvelous wordsmith going on an expedition for her next great book? The “lunar gothic” style of architecture could be seen on every moon and asteroid in the solar system. We crafted dead rocks into castles of dark, lacy towers. Their stained glass windows glowed sky-blue in the light of the faraway sun, holding back the terror of living the void.